Tracy Parlier never thought medical equipment would replace a kitchen table in her modest ranch home in Galesburg. She never thought she would be on a first-name basis with a state legislator. And Parlier never thought her boss, OSF HealthCare St. Mary Medical Center President Jennifer Junis, would take multiple plunges into a dunk tank to support her. All of those realities came to pass when Parlier, a lab assistant at OSF St. Mary Medical Center in Galesburg, found herself questioning her then-infant daughter Lily’s inability to sit up at five months. Lily was born prematurely and had other health complications, so it took 11 months before she was diagnosed with type II spinal muscular atrophy (SMA) in June of 2016. The disease is a form of muscular dystrophy and it’s the number one genetic cause of death for infants. 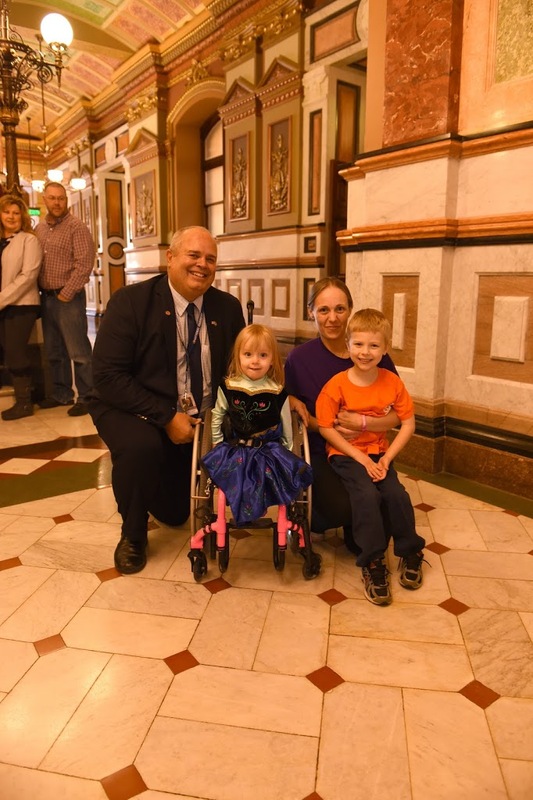 The disease has affected Lily’s ability to walk so she needs a wheelchair. She has a machine to make her coughs more productive and she has trouble eating, so most of her nutrition is delivered via a port in her stomach, although she occasionally eats a little of her favorites – French fries and popcorn chicken. Despite the devastating diagnosis, hope arrived at the beginning of the year when the federal government approved a drug called Spinraza, the first and only drug to date for treatment of SMA.The drug is administered by removing five milliliters of spinal fluid and injecting the same amount of the medication. Parlier says when administered early, even for babies with the most severe form of SMA, the drug can greatly improve quality of life and chance for survival. In July, U.S. Health and Human Services Secretary Alex Azar officially approved adding SMA to the official federal recommendations for newborn screening. But, individual states need to pass their own legislation to require the testing within the first 12 months of life. Tracy and Randy Parlier enlisted help from state Rep. Dan Swanson (R-Alpha) whom they connected with through a family friend. The Parliers traveled twice to Springfield to testify. Swanson says their testimony put a face on the disease and helped lawmakers understand the impact of early screening. Read more here.